I’m really happy to announce that the latest SudokuKids update (version 1.1) is now available for download in the App Store. 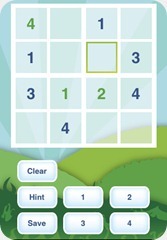 This is the first update for SudokuKids and it has a lot of little things that together really improve the app experience. The most noticeable improvement is the addition of the cool new music that plays when you enter the app. We’ve added new sounds as well for feedback as you tab squares and buttons while playing through the puzzles. Lots of little changes were made as well. I decided to change the color of number you enter yourself in the puzzle. As you can see in the picture to the right, numbers are in two colors. Dark blue for given number when the puzzle was started and green numbers are what you’ve entered. While it was a small fix, I’ve received a number of comments regarding how they like this from the SudokuKids+ app, so we brought it to this one along with a few other functions we didn’t have here. Anyway, I’m very open to hearing ideas for future updates to SudokuKids. Please feel free to share them below or send me an message.